Today's tip is a no-brainer, but it still took a Sephora guru to clue me in. When she told me, I totally had a "duh" moment in the middle of the Benefit Cosmetics section! 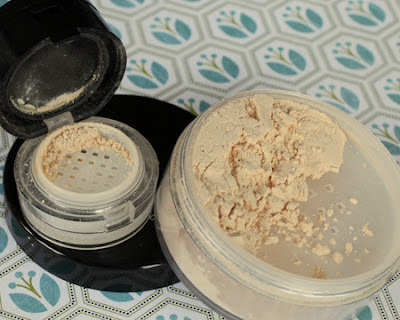 Have you ever opened your loose powder only to be greeted with a huge puff of powder smoke? I have and I owe it all to the revolutionary state-of-the-art powder shaker thingy. Sometimes, it's so bad there's more powder on top than underneath! By the time I tap and shimmy the container to coax the powder back down through the holes, I have powder all over my lap. When I give up, dunk my brush into the giant powder mound, I end up wasting a bunch of it while tapping off the excess. Resist the urge to yank off the entire sticker covering the holes on the shaker--I know it's fun, but resist. Instead, get a pin and poke through the seal to expose just 4 or 5 holes in the center. Wiggle the pin around to make sure the hole is big enough for powder to go through. 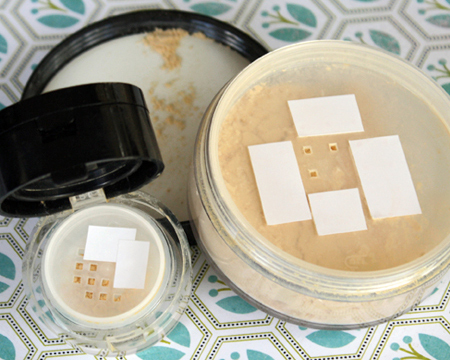 Then, when you're ready to use the powder, just tap some of it onto the inside of the lid. Voila! You'll get just enough powder and minimize waste. Makeup is expensive, y'all! You can also peel back part of the sticker and cut it off exposing just a few holes. I prefer the pin prick option because the powder will fall from the center and it's less likely to end up in the edge of the cap where sneaky powder falls out to coat your makeup bag. Hold up. You tossed the sticker months ago and now have a giant powdery mess? Not to worry. First tap the powder sitting on top of the sifter onto a piece of paper. Then, pull out the divider and pour the powder back in. Next, grab your toner or rubbing alcohol, dab some onto a cotton ball and use it to wipe the shaker piece (I thought of that part all by myself!) Let it dry completely. Now, why don’t those package designers just put 5 little holes in the center of the sifter in the first place and be done with it? Duh!